What is basil? About the ingredient basil. Including 2,737 recipes with basil, nutrition data, photos, where it's found, and video. Basil is normally used fresh in cooked recipes. It is generally added at the last moment, as cooking quickly destroys the flavour. The fresh herb can be kept for a short time in plastic bags in the refrigerator, or for a longer period in the freezer, after being blanched quickly in boiling water. The dried herb also loses most of its flavour, and what little flavour remains tastes very different, with a weak coumarin flavour, like hay. Basil is one of the main ingredients in pesto—a green Italian oil-and-herb sauce. Its other two main ingredients are olive oil and pine nuts. 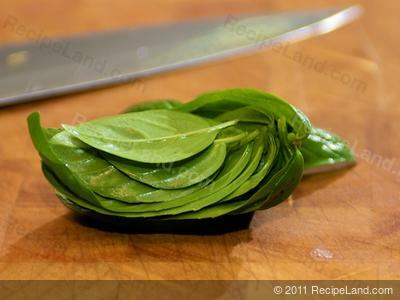 A popular technique is to "chiffonade" the basil. Roll up the leaves and roll as if making a cigar. Using a freshly sharpened knife slice the leaves cleanly. Be careful to be gentle and avoid overly brusing the leaves. There are 5 or 6 main varieties of basil a member of the mint family all differing in height color and taste. Each variety of this annual is very hardy and will grow in most climates. The exact species determines leaf color ranging from light to dark green to purple White flowers are common to all appearing at the tops of the branches. The basil most often used in the US is of the two tall varieties of sweet basil (Ocimum basilicum). Reaching a height of one to two feet its branches will spread out almost as far. Dwarf basil (Ocimum minimum) grows from six inches to one foot tall in either the green-leaf or the purple-leaf variety. These can form small bushes making excellent garden borders. The French use them frequently in formal gardens. All basil varieties have a unique fragrance and taste that add zest and flavor in cooking. In India basil is called “tulasi”. The Hindus regard it as a sacred herb, cultivating it near temple and home as protection against the misfortunes of life and as a guide to heaven in death. Basil offered protection against the dread malaria, as well as the assurance of fertility to those desiring children. Beads were made of the root to adorn the neck and arms and a rosary was made from the seeds. A leaf of basil was placed on the breast of the pious Hindu in death. Good fortune comes to those who build their houses where “tulasi” grows well, but only evil to those who inadvertently uproot the holy herb. Basil was “rayhan” to the Persians and could be found in cemeteries. Egyptians also regarded this herb as having a funereal symbolism. For the ancient Greeks, basil appeared as a symbol of hatred, but present day Greeks have a different opinion, for one sees this fragrant herb happily growing in blue pots on window sills, all over their country. 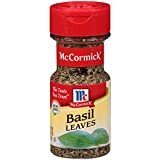 We must thank the Italians for finding a happy use for this herb: with a sprig of basil tucked behind her ear or in her dress, the peasant girl sets out to win her sweetheart. Basil is called “amorino” in Turkey. In Humania the enchanted herb, when given to a youth by a girl, makes him forever hers. This symbol of love takes on curative properties in Africa, where it is said that if one eats basil after a scorpion bite one feels no pain. Sweet basil is a delicious culinary seasoning. It is useful in almost any dish that can be “herbed” and is especially pleasing including in seafoods, salads, potatoes and vegetable soup dishes that contain tomatoes. Basil may be used fresh or dried. It makes a delightful, easily potted plant especially the purple variety. 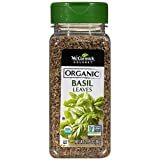 Use in any Italian dish, especially combined with oregano, or to flavor meats, vegetables, fish and soups Basil is a member of the mint family. It has a wonderful aroma and flavor and is one of the most popular and widely grown herbs in the world. Non-GMO Verified Product. Total Net Weight is 2.85 Oz (80 g). More detail Order now to save $0.02! More detail Order now to save $0.61! by Gel Spice Company, Inc. Basil is usually found in the produce section or aisle of the grocery store or supermarket. Basil is a member of the Spices and Herbs USDA nutritional food group. How much does basil weigh? There are 2861 recipes that contain this ingredient.